n the epoch of Confessionalization1 (1550 - 1750) many had to leave their homeland for reasons of faith: those who would not convert to the religious denomination of the ruler of the state had to emigrate ("cuius regio, eius religio"). This applied, for example, the Protestants in Bohemia who moved abroad between 1623 and 1680. From 1669, with a peak in 1685, the emigration of the Huguenots (French Protestants) was noticeable. King Louis XIV, with the Edict of Fontainebleau revoked the Tolerance Edict of Nantes2. The Edict of Fontainebleau (1685) forbad the Huguenots from the practice of their religion and of emigration under penalty of death. 200,000 Huguenots, among them Waldensians3 from the Pragela valley, managed to escape to Protestant countries, where they were gladly received as refugees. Within a few months, hundreds of thousands of people fled mainly to the Calvinist territories of the Netherlands, the Calvinist cantons of Switzerland, to Prussia and the Russian Empire. War, division of real estate4, crop failure, excessive burdens of government (taxes) and religious oppression caused emigration overseas at the end of the 17th Century. There were Protestants such as Mennonites5, Amish6 and Quakers7. Many of them came from the Palatinate, where they had shelter for only a few years or decades. 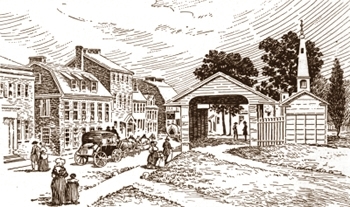 The main objective of the Quaker State of Pennsylvania, the land of opportunity, was religious and social freedoms, where each settler was approved a certain amount of arable land. In 1683, the first German settlement (Germantown) was founded in what is now Philadelphia, Pennsylavia, United States of America. In 1700, there were 64 families and by 1790 there were over 3,000 residents, the majority from the Palatinate and Württemberg. 1 Confessionalization = identifies the theory about the evolution of Church, State and society between the Peace of Augsburg (1555) and the Thirty Years War (1618-1648). The splitting of Christianity into several denominations caused large changes, not only in the Church and in the religious field, but in all areas of society. 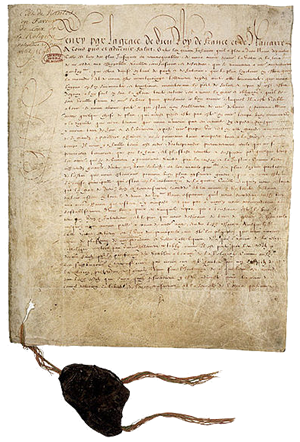 2 Edict of Nantes = The official decree which was signed in Nantes by the French King Henry IV on 13 April 1598. 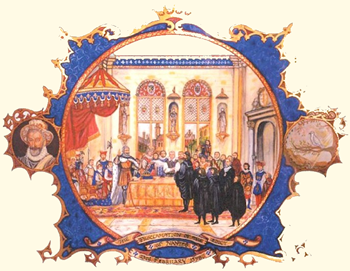 The decree guaranteed the freedom of religious expression and political privileges to the Calvinist Protestants (Huguenots) in Catholic France. Previously the Calvinists or Reformed Protestants suffered for more than 60 years of persecution which again and again led to civil wars, the so-called French Wars of Religion. Tens of thousands of Protestants were killed or left France during these decades. When the Huguenots once again opposed the Crown in the wars from 1621/22 and from 1625-29, they lost all their political rights and places of safety through the actions of Cardinal Richelieu, however, they were farther tolerated religiously. This de facto acquiescence ended with the official revocation of the Edict of Nantes by Louis XIV (Edict of Fontainebleau) in 1685 which limited the freedom of worship so much that more than 200,000 Huguenots had to leave France. 3 Waldensians = A Christian spiritual movement of the 12th century, considered as a precursor of the Reformation, which got its name from a rich citizen of Lyon, Peter Waldo Valdo, Valdes, Waldes or Pierre Vaudès. 4 Division of real estate = The possessions of a family, in particular the land, which was divided 'real' among the beneficiaries. This division took place at each inheritance, so that over time there were an increased the number of ‘mini’ plots. In agriculture the continued division of real estate led to a fragmentation of arable land in a variety of small fields, often in the form of narrow strips. In 'Old Württemberg' this division of real estate resulted in fields that were soon too small to feed a family and resulted, in part-time farmers in Württemberg who operated as craftsmen. At the same time the inherited estate secured a minimum maintenance, because you inherited not only a piece of land, but also a part of the parental home. However, there was often only single room where entire families crowded together. 5 Mennonites = Followers of an evangelical Free Church which practiced adult baptism and refusal of military service and the swearing of an oath. 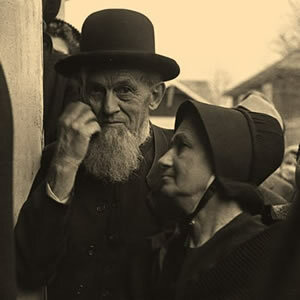 6 Amish = A group of Amish Mennonites who, because of their stricter view of church discipline, separated from the rest of the Mennonites in 1693 and have since formed their own religious community. 7 Quakers = A Christian religious community, which became widespread, especially in the English-speaking parts of the world and in Africa. The basic belief is the concept of enlightenment through God that can reach every person as a source of knowledge of God and a truly Christian life. Sacraments, baptism and communion as children were discarded; pleasures were considered offensive; and military service was refused.